In the age of the internet discount drum sets are often just a few clicks away. And Amazon in particular offers lots of ways to save lots of money. 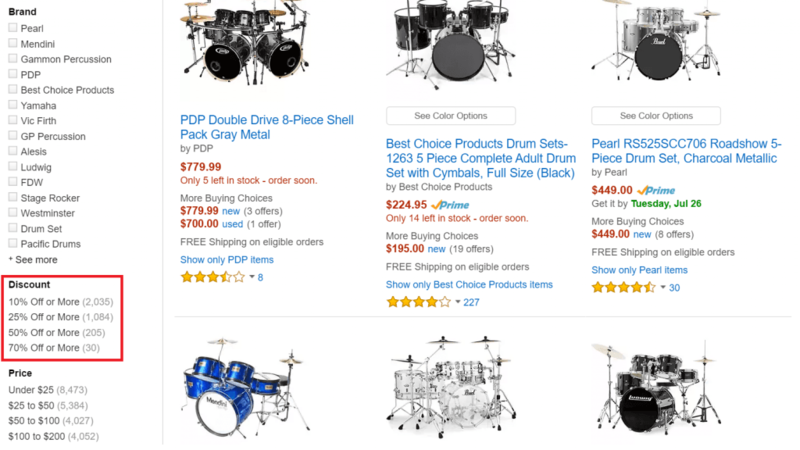 So I’ll show you 9 simple ways to find budget drum sets on Amazon. You can instantly start using them and you’ll find discount drum sets at up to 40% off. And if you don’t want to buy on Amazon, let me tell you about other great places to buy drums online. If you do, enjoy the article and also keep an eye on my review section. You’ll find in-depth reviews of many of the electronic, acoustic and kids drum sets there. Did you know there’s a browser extension that automatically scours the entire web for coupon codes once you add something to your cart in any online shop? Well, there is! It’s called Honey, and you can install it in any browser other than the Internet Explorer in seconds and without paying a dime. Once it’s installed and you enter your shopping cart, the Honey icon in your browser will turn gold and show you all available coupons for the particular online store in a pop up. Obviously there won’t be many Amazon coupons specific to drum sets, but you’ll regularly get a general discount or free shipping. In Amazon’s outlet, you’ll find hundreds of budget drum sets which are new and fully intact but overstocked or belong to a series that’s running out. 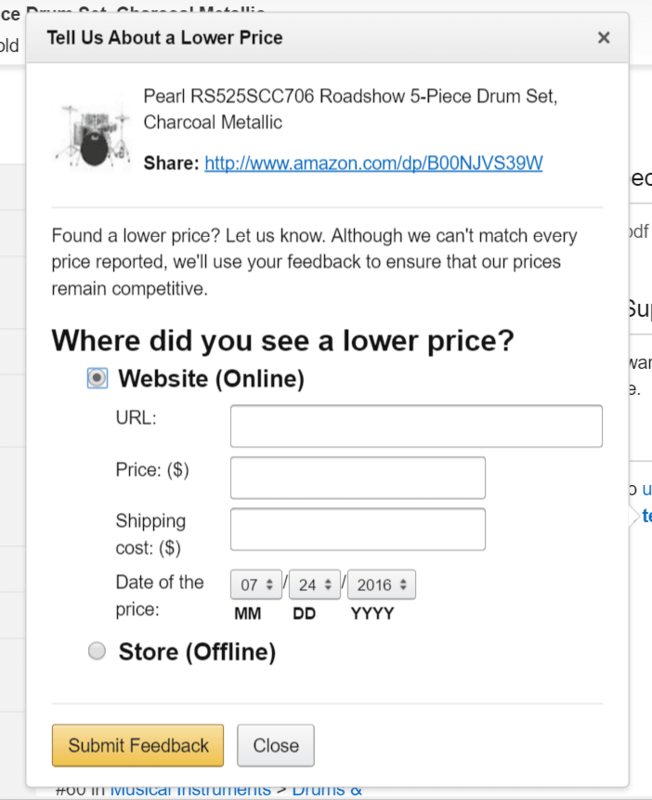 In the drums & percussion outlet, you can use the sidebar navigation to quickly find out discount drum sets by a particular brand. 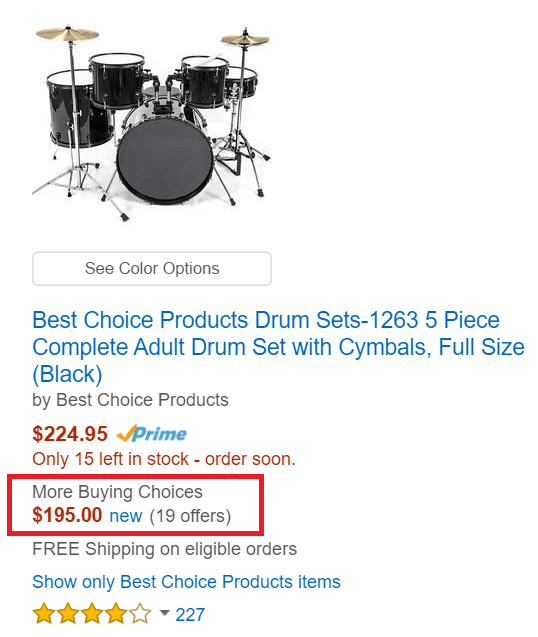 Discount drum sets could also be lurking in Amazon’s warehouse deals section. It houses budget drum sets that are completely new and functioning, but whose packaging got damaged during shipping. This Alesis DM6 would normally cost you 399$, so it’s worth checking out the drums & percussion warehouse deals. Please go through all pages (or use the brand filter) or you’ll miss out on deals like the DDrum Journeyman (on page 3) which was 859$ and is now at 529$. Wonder why some results seem not to be discounted at all? In these cases the discount is in the “More Buying Choices”. See the acoustic drum sets currently 10% off or more. See the electronic drum sets currently 10% off or more. CamelCamelCamel might be a strange name, but it sure as hell will help you stay informed about the lowest prices for the drum set of your choice. And now that you know all about the past prices of that drum set, CamelCamelCamel also alerts you once it drops to the price you specify (under “desried price”). Cool, right?! In case you’re only interested in future price drops, you can also go to a drum set’s product page and add the kit to your wishlist (“Add to List” below the “Add to Cart” button). Amazon will then send you an email notifaction when the price drops. 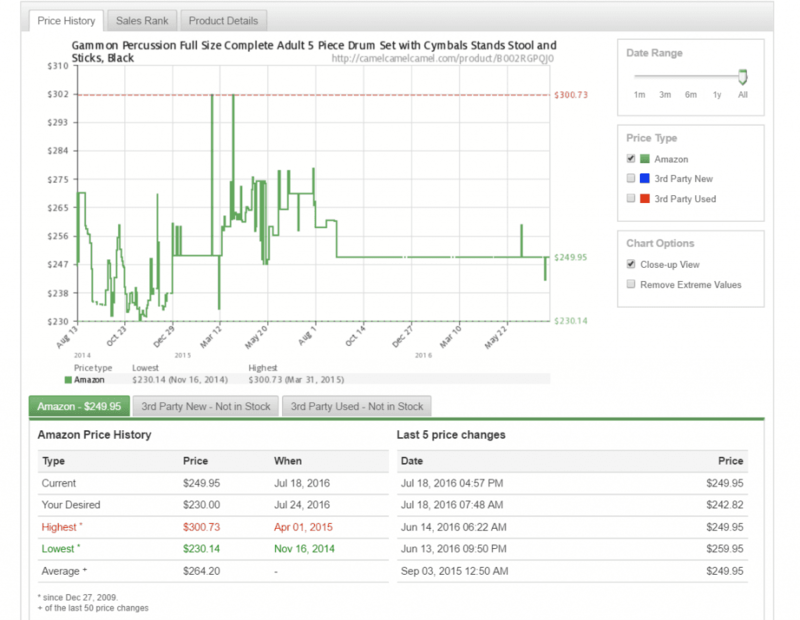 Found discount drum sets somewhere else than on Amazon? If you still want to make use of Amazon Prime advantages (like free delivery or overnight express), you can. …and provide them with the online or offline details of the store. Depending on where you saw the budget drum sets and under what circumstances they were discounted, Amazon can obviously choose to not lower the price. But it did work with one drum set for me. This hack comes with a question mark as it doesn’t work all the time. But it’s easy to do and did work for me in some cases. Put the drum set of your choice into your cart and leave it there for a few days. With a little bit of luck, Amazon will soon send you an email encouraging you to finish your purchase – and give you a discount code. 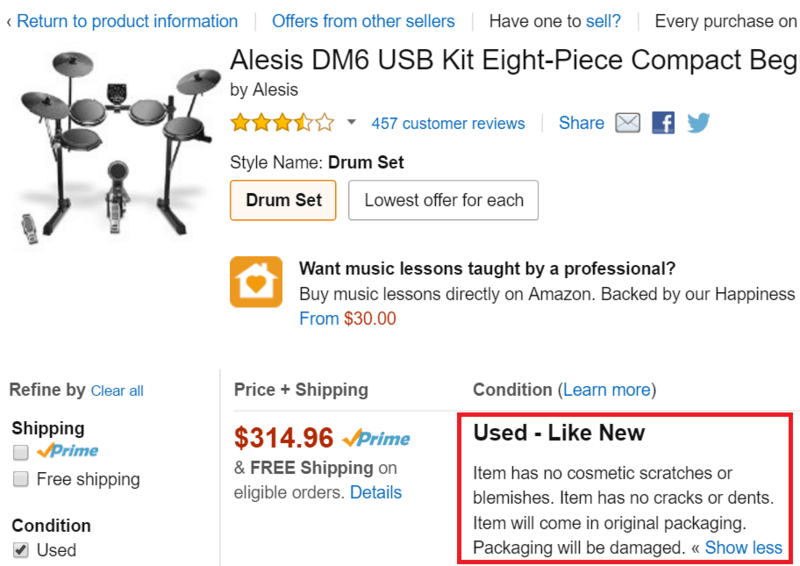 Forced discounting is obviously not for you if you’re in a hurry, because you really have to sit on the kit for some days, so Amazon thinks you’re unsure whether to buy or not. But if you’ve got some time, try it out. I’ve had discounts of up to 20% with this. Yes, this isn’t a discount in the strict sense. But drum sets are normally heavy on shipping charges, and you can save substantially if you get your drum kit shipped for free. And that’s what Amazon Prime does for you – without paying a cent. Simply sign up for the 30-day free trial of Prime and cancel again before the trial ends. You’ll profit from free two-day shipping on all items you pruchase during that time, and you’ll also have access to Amazon’s large library of movies and series. So there you have my favorite tactics for squeezing discounts for drum sets and drum gear out of Amazon. You want to do this when shopping for other products on Amazon. Well, just apply the tips above, most of them should work irrespective of whast you’re buying. Need even more tactics? Well then have a look at this extensive list of Amazon shopping hacks. Was that a question about anything I said above? Or do you have stealthy discount tactic of your own you’d care to share. In any case, I’d love to hear from you in the comments. I reply 100% of the time!